"What did the world's first football draft look like?" you may ask yourself (or perhaps not). But if you were ever curious, Avocados From Mexico has the answers you seek. The produce brand will run its first Super Bowl spot at the end of the first quarter. The full ad will be kept secret until game day, but the brand just released a 30-second teaser for the "First Draft Ever" campaign. 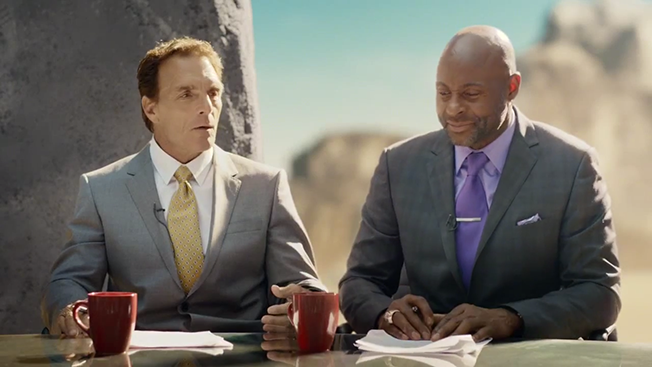 The spot stars NFL legends Jerry Rice and Doug Flutie sitting behind a desk, presumably preparing to anchor the first draft. All seems normal as the two make small talk before the cameras roll—they discuss the steep price of babysitters, who seem to be more interested in money and cable TV than in watching children. Kids these days! Then, things take a turn for the weird. See that rhinoceros there? He might be eligible for the draft. With this spot, Avocados From Mexico will become the first fresh produce brand to run an ad during the Big Game. The commercial is also part of a larger campaign from the brand to promote guacamole consumption (nachos, anyone?) and, of course, avocados.